RevenueWell is one of the most powerful patient communication systems on the market, and distinguishes itself from the competition with its ability to automatically message patients with unscheduled procedures, based on their treatment plan. As one of the few systems designed specifically for dentistry, it's also one of the most affordable, and doesn't require any long-term contract. RevenueWell is one of the newer automated dental patient communication systems on the market, but it's also one of the best options. Thousands of dental practices use RevenueWell to help reduce no-shows, reactivate inactive patients, and solicit patient reviews. Priced at $299/month, without any long-term contracts, RevenueWell is a powerful, yet affordable option that can help your practice connect with patients, and save your staff time by automating many routine tasks. Special offer for SoftwarePundit readers: Receive 30 days free when you sign up through our referral link. Offer valid for new RevenueWell users only. Launched in 2012, RevenueWell is a popular automated patient communication system. Its primary value-added is its ability to help dental practices reduce no-shows and reactivate patients. Outside of its core competencies, RevenueWell also includes other functionality, such as online reputation management, and online appointment requests. However, we think that RevenueWell's primary strengths lie in its automatic messaging capabilities, which are more powerful and customizable than many other systems on the market. For example, the online scheduling requesting are fairly basic, especially in comparison to other systems that strictly focus on online appointment scheduling. In addition, any reviews that appear on its microsite, Patient Connect 365, are less valuable than reviews on more reputable review sites, such as Google, Yelp, or Facebook (though this is also true for other patient communication systems that also solicit reviews on their own microsites). There are currently about 7,500 U.S.-based dental practices listed on Patient Connect 365, though not all of them are currently active clients. This is a good estimate of the number of dental practices that use RevenueWell, or have used it in the past. Given that the system has only been around since 2012, and many of its competitors have been in business since early 2000, RevenueWell has gained a significant amount of adoption in a short timespan, and we expect its user base to continue to grow, given how strong the product is compared to other systems on the market. As a consequence of being one of the newer patient communication systems on the market, RevenueWell is somewhat limited in the practice management systems that it integrates with. However, it integrates with some of the most popular systems, including Dentrix, Eaglesoft, and Open Dental. If you don't use any of these systems, you'll likely have to consider using an alternative option that does integrate with your practice management system. Below, we'll discuss some of the key features of RevenueWell, and how they can benefit your dental practice. RevenueWell integrates with your practice management system in order to identify patients who are overdue for an appointment and should be messaged, based on criteria that you specify. The system is customizable, and lets you determine the time that the message is sent, the content of the message, and the medium used (text, email, phone call, or postcard). One of RevenueWell's most powerful features is that it's able to identify patients who are not currently scheduled for upcoming procedures, based on their treatment plan. You can then configure the system to message these patients, and make sure that these procedures get scheduled. RevenueWell's messaging capabilities are powerful methods that bring patients back into your office, and play an important role in patient retention. In addition, by automating a lot of these tasks, your staff will be able to spend less time on the phone, so that they can focus on providing the best in-office patient experience possible. Once a patient has scheduled an appointment, RevenueWell provides a few different ways to remind patients about their upcoming appointments in order to help reduce cancellations and no-shows. 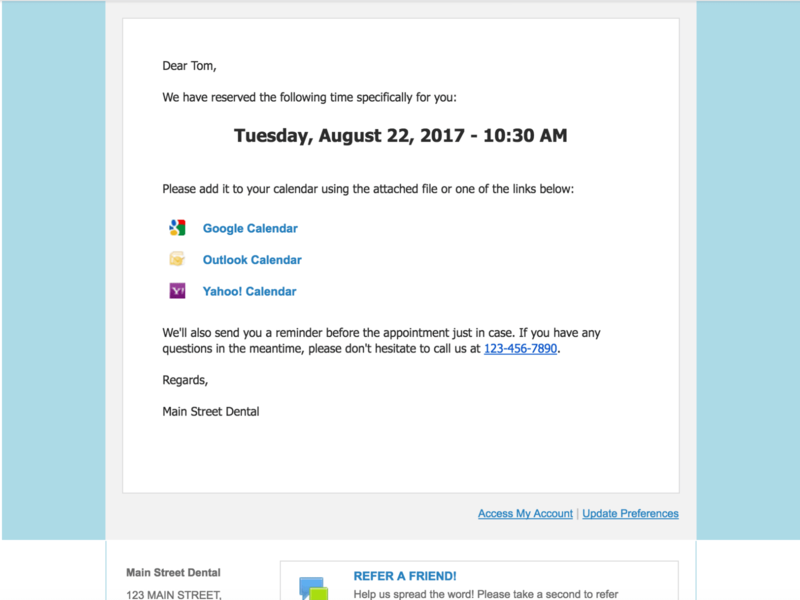 RevenueWell can send out save-the-date email reminders, which ask the patient to add the appointment to their email calendar (e.g. Google Calendar, Outlook Calendar, or Yahoo Calendar). 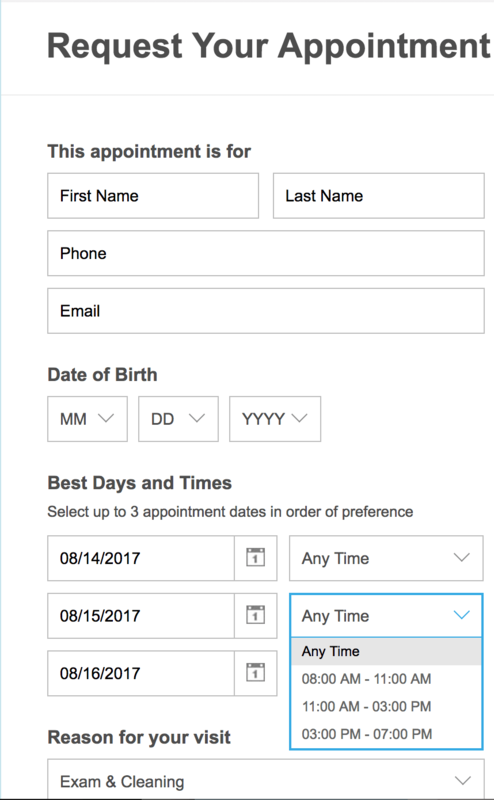 The email will include widgets that make it easy for patients to quickly add the appointment to their calendar of choice, as you can see in the example below. Once the appointment is on the patient's calendar, their mail client will automatically send them reminders as the appointment approaches. In addition, on the day of the appointment (or a few days before -- this is configurable), RevenueWell can also send the patient a reminder via text or email. You can also use RevenueWell to request appointment confirmations. Once the patient confirms their appointment, your practice management software's schedule will also receive the confirmation. This helps make sure that both systems stay in sync, and reduces the possibility of manual error. Like many other patient communication systems, RevenueWell helps solicit reviews from patients. After a patient has completed their appointment, RevenueWell can send them an email asking them to provide feedback. 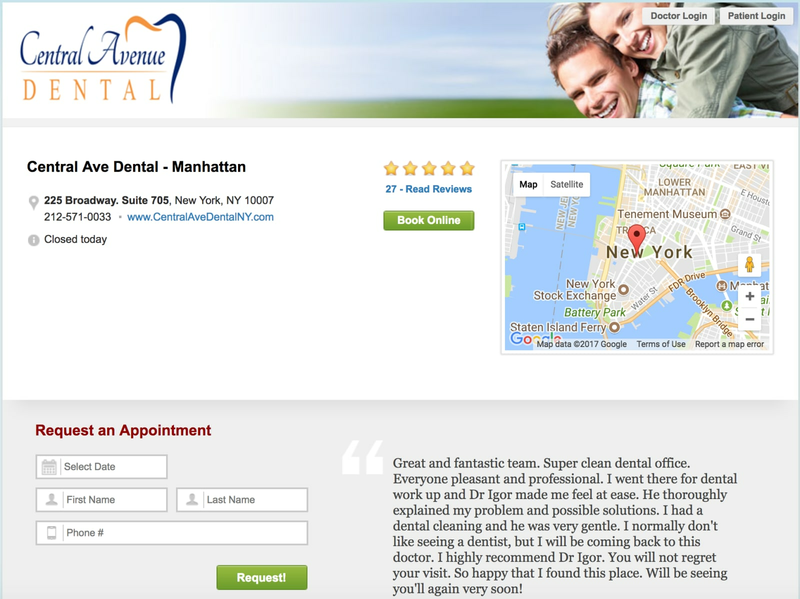 As you can see, the profile will contain information about your practice, in addition to patient reviews. However, keep in mind that the reviews on these microsites generally aren't that valuable, because of lack of name recognition. 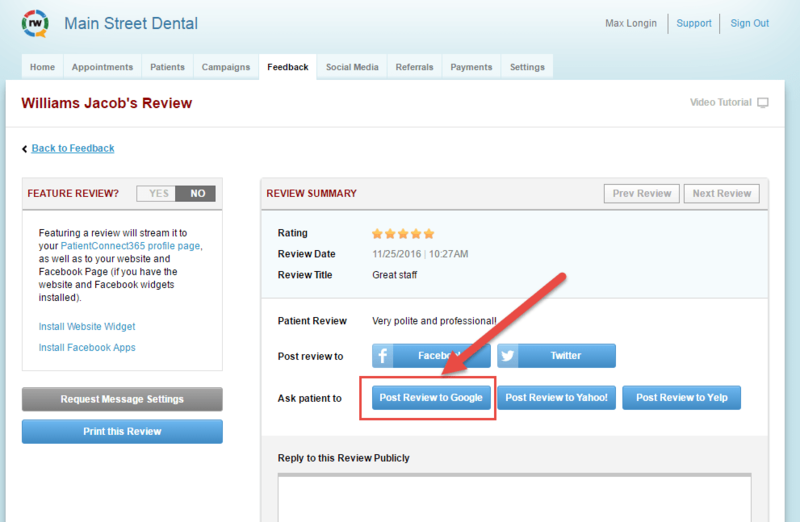 For example, even though patients will see your microsite when they search on Google for your dental practice, they generally won't recognize Patient Connect 365 as a reputable reviews site, which means that they will still typically prefer to consult Google or Yelp reviews. However, a nice touch that RevenueWell provides is that if a patient fills out a review, you can then ask them to repost their review on Google or Yelp. This is a nice perk compared to many other patient communication systems, which simply post the review to their microsite without providing an easy way to ask patients to cross-post their reviews across more widely recognized websites. Your Patient Connect 365 profile can also serve as an online patient portal, where patients can sign in and access their appointment history, documents, and pay bills online. Instead of having to call your office or dig through emails to find this information, they can simply access it all through the portal. This is a nice touch that adds another level of convenience for the patient. It can also save your staff time, since they won't have to field as many phone calls or emails from patients who want to ask for this information. Most other patient communication systems don't offer this capability on their microsite -- typically, these microsites are used simply as a source of reviews and business information. Because Patient Connect 365 also serves as an online patient portal, we think it offers dental practices the best microsite, compared to other automated patient communication systems. Though RevenueWell advertises that it can help enable online appointment scheduling, this functionality is essentially as basic as asking new patients to email your dental practice to set up an appointment. On your practice's Patient Connect 365 profile, patients can request appointments for a specific time of day, but they won't know if the slots are actually available, since the slots aren't synced up with your practice management software's schedule. Notice how every time appears to be available. This can be inconvenient for patients, who will likely have to go through several emails or phone calls in order to finalize a time for their appointment. For this reason, if you're interested in adding online appointment scheduling capabilities to your practice, you should consider investing in an alternative online appointment scheduling system that offers more sophisticated capabilities. Is RevenueWell right for you? Though RevenueWell is one of the newer automated patient communication systems on the market, it's also one of our top choices, and comes at an affordable price point without requiring you to commit to a long-term contract. The system has virtually all of the functionality that some of its more expensive competitors offer, along with some additional nice-to-have features. For example, not all systems are able to identify patients who have unscheduled procedures based on their treatment plans. In addition, RevenueWell's microsite Patient Connect 365 also serves as an online patient portal, which is a unique feature. However, RevenueWell's integrations are somewhat limited compared to its competitors'. Therefore, if you don't use Dentrix, Eaglesoft, Open Dental, or PracticeWorks, you'll have to look elsewhere. But if you do use one of these supported practice management systems, then RevenueWell is one of the best automated patient communication systems for dental practices to consider. To learn more about RevenueWell, you can visit their website here. Users who sign up for RevenueWell through our link will receive 30 days free.